What is pretty basketball? 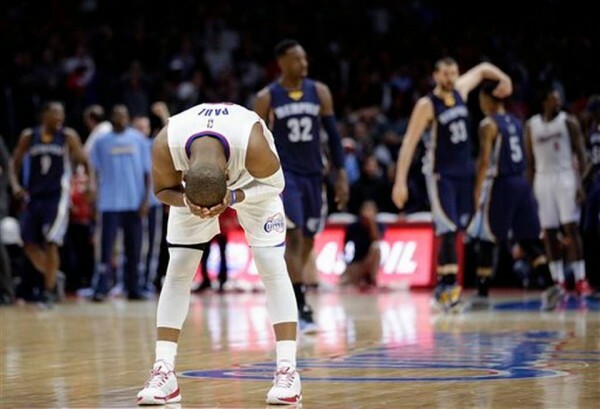 Whatever it is, it’s not something the Memphis Grizzlies play. But if their style gets them eventually to a championship, perfectly doable this season, it’s not going to matter if they don’t pass the eye test, like in their 90-87 win over the Los Angeles Clippers. The Grizzlies have been fantastic since trading for Jeff Green back in January, going 16-3 since that trade, the second best record in the league during that stretch behind only the Cleveland Cavaliers, winning 16 of their last 18 games. Green scored 16 points with three 3-pointers and is averaging 12.5 points per game in a smaller role for the Grizzlies compared to his Celtics time, but it’s probably a lot better for him to be on such a successful team. Mike Conley led the Grizzlies with 18 points and 7 assists, delivering his biggest play with a steal off of Chris Paul, who has a tendency to make these mental mistakes and walk himself into traps during late and close situations. Maybe there was a small foul by Courtney Lee, but Paul should know how to stay away from these double teams, coming after one of his best games this season, scoring 30 points with 10 assists. The Clippers haven’t really been hurting since Blake Griffin went down with an injury, but their offense looked like it sorely missed something without him, as Spencer Hawes was unable to stretch the floor or provide what the Clippers needed. DeAndre Jordan did score 9 points on 4-of-4 from the field and grabbed 17 rebounds, but Jordan not being able to do anything offensively except dunk the ball keeps hurting the Clippers when a bit more creativity is needed, or they face a team like the Grizzlies that’s able to match up him down low with size and strength. While Paul didn’t have the happiest of endings, he did reach the mark of 12,500 points and 6,500 assists in his career in less than 675 career games, something achieved only by Oscar Robertson, Magic Johnson and Isiah Thomas. Unlike them, Paul is still looking for a way to get him an NBA title ring. Heck, getting to a conference final might be nice for him, still unable to break that barrier after a decade in the league. The Grizzlies have only one conference final in their history, two years ago, getting swept by the Spurs. A lot of the players that went through that are still on the team, but it’s hard to argue about the Grizzlies being better and more balanced with the changes they’ve made since then. Last year an injury put them in a difficult situation and a lower seed than they deserved. This season, it’s going to be a lot more difficult standing in the way of their championship aspirations.